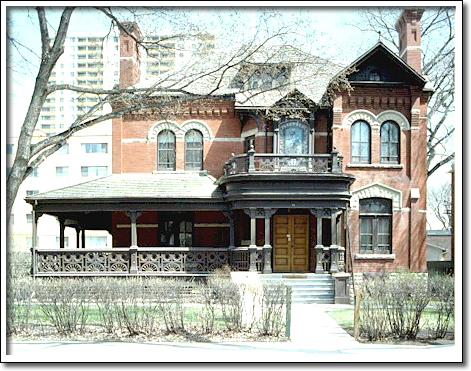 This splendid red brick house was built in 1895 for Sir Hugh John Macdonald (1850–1929), son of Canada’s first Prime Minister, Sir John A. Macdonald. One of the few remaining examples of the work of architect Charles H. Wheeler, it is representative of domestic architecture executed in the Queen Anne style. Named "Dalnavert" after the birthplace of Hugh John’s maternal grandmother in Scotland, it is a reminder of Winnipeg’s first affluent neighbourhoods. Macdonald and his wife, Lady Agnes, made Dalnavert a centre of social life and hospitality in early Winnipeg. Hugh John Macdonald was knighted in 1913. Briefly Premier of Manitoba during 1900, his long and colourful career included service as soldier, Member of Parliament, Member of the Legislative Assembly, and police magistrate for the City of Winnipeg. Threatened with demolition in 1970, Dalnavert was saved by the Manitoba Historical Society and by 1974 was restored to its former elegance.